Democrats have been shouting for over a year that Russia hacked our internet servers and interfered in our election. On Friday, the Grand Jury Indicted 12 Russian Intelligence Officers for Hacking Offenses Related to the 2016 Election. The officials in Unit 26165 coordinated with officials in Unit 74455 to plan the release of the stolen documents to interfere with the 2016 presidential election. Defendants registered the domain DCLeaks.com and later staged the release of thousands of stolen emails and documents through that website. On the website, defendants claimed to be “American hacktivists” and used Facebook accounts with fictitious names and Twitter accounts to promote the website. After public accusations that the Russian government was behind the hacking of DNC and DCCC computers, defendants created the fictitious persona Guccifer 2.0. On the evening of June 15, 2016 between 4:19PM and 4:56PM, defendants used their Moscow-based server to search for a series of English words and phrases that later appeared in Guccifer 2.0’s first blog post falsely claiming to be a lone Romanian hacker responsible for the hacks in the hopes of undermining the allegations of Russian involvement. It is important to note that, a) There is no allegation in the indictment that any American was a knowing participant in the alleged unlawful activity or knew they were communicating with Russian intelligence officers. b) There is no allegation in the indictment that the charged conduct altered the vote count or changed the outcome of the 2016 election. c) The outlining of the Terms (everyone charged with a crime is presumed innocent unless proven guilty in court. At trial, prosecutors must introduce credible evidence that is sufficient to prove each defendant guilty beyond a reasonable doubt, to the unanimous satisfaction of a jury of twelve citizens,) only applies to American citizens. Russia has their own set of rules for their country. Russia does not have to comply with these indictments. Can the US sanction them? Yes, but to what degree? I’ll dive into this later. In an exclusive interview with NBC's Megyn Kelly, Putin denied the charge by U.S. intelligence services that he ordered meddling in the November 2016 elections. “Why have you decided the Russian authorities, myself included, gave anybody permission to do this?" asked Putin. Mueller is investigating whether the Trump campaign colluded with the Kremlin. "So what if they're Russians?" Putin said of the people named in last month's indictment. "There are 146 million Russians. So what? … I don't care. I couldn't care less. … They do not represent the interests of the Russian state." Putin even suggested that Jews or possible Americans had been involved. "Maybe they're not even Russians," he said. "Maybe they're Ukrainians, Tatars, Jews, just with Russian citizenship. Even that needs to be checked. Maybe they have dual citizenship. Or maybe a green card. Maybe it was the Americans who paid them for this work. How do you know? I don't know." Asked whether he was concerned about Russian citizens attacking U.S. democracy, Putin replied that he had yet to see any evidence that the alleged interference had broken Russian law. "Are we the ones who imposed sanctions on the United States? The U.S. imposed sanctions on us." “We in Russia cannot prosecute anyone as long as they have not violated Russian law," he said. "At least send us a piece of paper. … Give us a document. Give us an official request. And we'll take a look at it." U.S. intelligence agencies and many Western analysts have said that Russian interference came at the orders of the Kremlin. Putin dismissed this. "Could anyone really believe that Russia, thousands of miles away … influenced the outcome of the election? Doesn't that sound ridiculous even to you?" he said. "It's not our goal to interfere. We do not see what goal we would accomplish by interfering. There's no goal." John Brennan, a former CIA director, and now an NBC News analyst, say Moscow's goal was clear. "To weaken the United States government," Brennan said in a separate interview, summarizing his opinion of the Kremlin's aims. This, he added, was so "the U.S. government is not going to be able to deal with international issues and confronting Russian aggression as assertively as it needs to." Trump has called Putin "a strong leader" who has "done a very brilliant job in terms of what he represents and who he's representing." Trump has also hinted that he gives Putin the benefit of the doubt when he denies that Moscow interfered. "[Putin] said he absolutely did not meddle in our election. He did not do what they are saying he did," Trump told reporters aboard Air Force One en route to Hanoi following a meeting with Putin on the sidelines of the APEC summit in Danang in November. Putin called the U.S. president "a businessman with vast experience" and "a quick study" despite being new to politics. "He understands that if it is necessary to establish a cooperative relationship with someone, then you have to treat your current or potential partner with respect," Putin said. "Engaging in mutual accusations and insults, this is a road to nowhere." Putin said he doesn't read Trump's tweets and doesn't tweet himself. Asked why not, he said: "I have other ways of expressing my point of view or implementing a decision. Donald is a more modern individual." Putin is facing little opposition in the presidential election whose first round is on March 18. "Well, we will see. It's up to the Russian voters," he said. Regarding the future of Russia-U.S. relations, he says Russia is the victim. "We are not the ones who labeled you our enemies. You made a decision, at the level of parliament, at the level of Congress and put Russia on your list of enemies," he said. "Why did you do that? Are we the ones who imposed sanctions on the United States? The U.S. imposed sanctions on us." Putin said that he would be willing to repair relations with Washington. "Listen, let's sit down calmly, talk and figure things out," he said. "I believe that the current president wants to do that, but there are forces that won't let him do it." After listening to the interview, you have to ask yourself these questions. What would Putin gain by interfering in the elections and why do we admittedly interfere in theirs? If we vote with our own set of morals and ideology, how are a bunch of negative ads going to sway our vote? Are we that shallow as a whole? I know that no ad will ever determine my vote. It’s a fact that Obama knew about interference before his departure. He used the “red phone” and told Putin to “cut it out.” With that knowledge, why was it that the Liberal Stream Media, Hillary’s campaign committee, the Hollywood Elite and Obama himself so positive Hillary would win? Didn’t the interference cause any concern? Obama went on Jimmy Kimmel and in response to a tweet by Trump “President Obama will go down as perhaps the worst president in the history of the United States,” he said, “Well, @realDonaldTrump, at least I will go down as a president, and a phone drop.” This was at the end of October, and so was the red phone incident. There appears to be no concern at all that Hillary may lose. Putin brought up the Kennedy Assassination and the uncertainty of the government’s involvement. He also mentioned there is no way for him to know if the US didn’t have something to do with the cyber attacks. Mueller investigated the Anthrax attacks for ten years and wrongfully accused someone of the crime, for five of those years. Then he moved on to another victim and didn’t try him until he committed suicide from all the harassment and cruelty he went through. He was then found guilty. Mueller never went after terrorist, which was the path to take. He went after Americans. Why, because he wanted a win. This was the most significant case of his career. Just like Russia, indictments will not bring convictions. Mueller botched that case and spent ten years and countless taxpayer dollars to do it. He has been given another chance. He wants a win. Russia indictments will not suffice. He is doing everything in his power to pin this on our President. I put nothing past him. He did hire Peter Strzok, and we know he was jaded. Obama canceled his summit with Putin. His reasoning was because Putin had granted Asylum to Snowden. Obama spent eight years doing everything in his power to make the US a third world country. He even orchestrated it so the Government could spy on the American people. Snowden was a whistleblower. This wasn’t something Obama ever planned for. He had to do damage control, and people were now on high alert. There are those who say Snowden committed treason and Obama had every right to want him extradited to the US to be tried. Here is my issue with the Snowden ordeal. Obama put Chelsea Manning in prison for treason. Chelsea became a “Plan B” for Obama when he asked to have hormone treatment in prison. Obama was hell-bent on including those cost to the taxpayers. This would give him an edge with the “LGBT community. If this sounds far-fetched, Chelsea was pardoned by Obama before his exit from the White House. He would need Chelsea to rally the LGBT community for Hillary. After all, she had to keep his plan alive. Before the Snowden debacle, Obama was touring every country and embarrassing the US by apologizing for us. He also destroyed many nuclear weapons while other countries were increasing theirs. He cut military budgets, was behind every “false flag” to gain control of the majority of the guns in America. He forced Obamacare on us which would decrease the average income per household and he bifurcated Americans setting us back decades. Obama was weakening our defenses. He was weakening us as a country. There is no doubt he would have colluded with Russia, given the chance. Obama laughed at Mitt Romney when he called Russia our number one enemy back in 2012. Why wouldn’t he consider Russia a threat? Did he, and was he playing it off so we wouldn’t? Trump - “Obama did NOTHING to stop the collusion!! Also, why did Obama “tap” my phones & spy on my campaign? !” Obama was listening to everything going on. This is why he wasn’t concerned about Russia and Trump. He already knew they weren’t talking. I will never believe the Democrats had nothing to do with the so-called “collusion”. I believe they created it and are now trying to set up Trump for impeachment. Trump had no reason to work with Putin. How would he ever know that sending mass amounts of negative ads regarding Hillary would work? Well, it didn’t. Hillary lost this one all on her own. She is pure evil, and it finally caught up with her. Well, hopefully they indicted real Russians this time, and not the fake ones like they did the first time. Sorry, I’m still not sold on the Russian interference narrative. 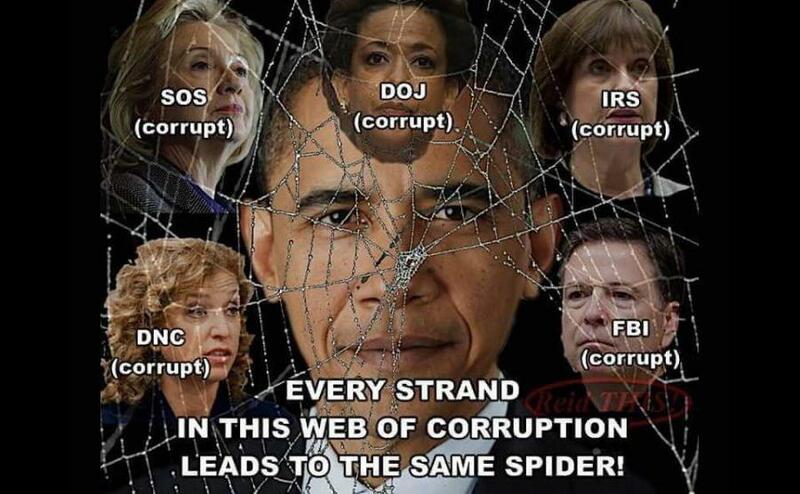 Obama and the Democrats interfered in our 2016 Election, worse than any foreign national ever could. This one needs to go viral!! Great job, Lexy! The Russians are bad but the LibNuts are worse. Full of LIES! Great article! Does the fact that they did not wait for these "Russians" to be in a position where they could be charged & arrested bother anyone? Why would they tell these Russians that they are being indicted? Giving them the chance to avoid prosecution? Great article, Lexy!!! The real interference was within, and there needs to be accountability! Learning the level of deceit and corruption from Hillary’s campaign, it should realistically force the American voter to never consider voting Democrat again in their lifetime. Donald Trump is a sparkling diamond and they are a full load of .